In support of the premise that Moses was a god (either in a representative sense, or in the sense of an exalted, deified being), two texts in Exodus are commonly quoted. Let’s look at them. “And he shall speak for you to the people, and he shall be as your mouth, while you shall be to him as God” (Exod.4:16). In the Greek Septuagint translation, the last clause of Exodus 4:16 is paraphrased, “while you shall be to him the things pertaining to God [ta pros ton theon].” This expression (which may strike us as odd) is found in the NT (Rom. 15:17; Heb. 2:17; 5:1). Clearly, the LXX translators also understood the Hebrew to be saying something other than that Moses was God or a god. The Vulgate, by the way, followed the Septuagint here [in his quae ad Deum pertinent], as do translations dependent on the Vulgate (such as the Douay-Rheims, “in those things that pertain to God”). “Behold, I have made you God to Pharaoh, and Aaron your brother shall be your prophet” (Exod. 7:1). The English versions differ as to the precise translation of the first clause of Exodus 7:1. A few contemporary versions agree with the KJV, which takes it to quote the Lord as saying to Moses, “I have made thee a god to Pharaoh” (so, with slight and irrelevant variations, the KJV, NAB, and NJB). Most contemporary versions take the verse to quote the Lord as telling Moses, “I have made you like/as God to Pharaoh” (so, again with minor variations, the ESV, HCSB, NASB, NET, NIV, NKJV, and NRSV). Several versions offer paraphrases that amount to the same thing: “I have put you in the place of God to Pharaoh” (CJB); “I have set thee in God’s stead to Pharaoh” (JPS 1917); “I place you in the role of God to Pharaoh” (TNK); and “I will make you seem like God to Pharaoh” (NLT). The majority of versions is not always right, but in this instance exegesis of the text shows they are quite correct. The Hebrew says, “I have made you elohim to Pharaoh.” Notice that the Lord (Yahweh) did not tell Moses that he “is” elohim but that the Lord has “made” Moses elohim “to Pharaoh.” These qualifications make it absolutely clear that this text is to be understood along the same lines as Exodus 4:16, which as we have seen in the Hebrew is a simile. In this text the lack of the particle meaning as simply changes the figure of speech from a simile to a metaphor. A metaphor is a figure of speech in which a comparison is made without the use of the words as or like. In other respects, though, a metaphor is equivalent to a simile in terms of the resulting meaning. Thus the sentences, “My daughter is like an angel” and “My daughter is an angel” mean exactly the same thing. Anyone reading the first sentence and then shortly thereafter reading the second sentence ought to have no trouble understanding that the second sentence is a metaphor. Even if one were to prefer the rendering “a god” in Exodus 7:1, in context the statement would still be metaphorical. That is, if that were the correct translation, then the text would mean that the Lord said that he would make Moses like a god to Pharaoh. As we have seen, neither Exodus 4:16 nor 7:1 asserts that Moses was God or that Moses was a god. Rather, they express through simile and metaphor the idea that Aaron (4:16) and Pharaoh (7:1) will relate to Moses as if he were God in relation to them. In this light, how do the interpretations advanced by Jehovah’s Witnesses and Mormons fare? The Jehovah’s Witness interpretation is that Moses was called “God” or “a god” in the sense of functioning as a representative of the true God, Jehovah. They argue that this usage in Exodus establishes biblical precedent for understanding the use of the term “God” or “a god” in reference to Jesus Christ (specifically in John 1:1, though potentially also in other contested NT texts) as likewise a functional, representational usage. That is, they argue that the Word (the pre-incarnate Jesus Christ) was not actually God, but functioned as God’s representative or agent. Whatever else may be said about this agency interpretation of NT references to Christ as God, the two Exodus texts are of no help in establishing precedent for that view. The Lord’s statements in Exodus 4:16 and 7:1 employ figures of speech (simile, metaphor) to describe Moses’ status specifically in relation to Aaron and to Pharaoh as comparable to God in one very narrow sense: when Moses speaks through Aaron, it is as though God were speaking through his prophet. Nothing in Exodus broadens this usage beyond those specific statements. The Lord did not even tell Moses that he would be God to the Israelites. No human being—not even Aaron or Pharaoh—ever addresses Moses as God, refers to Moses as God, or speaks of Moses as if he were God. The Bible nowhere actually calls Moses “God.” The idea that a creature may be called “God” in the Bible in the sense of being God’s agent or representative is not supported by the statements in Exodus 4:16 and 7:1. These figurative statements about Moses actually stand in stark contrast to the affirmations in the NT that Jesus Christ is theos (John 1:1; 20:28; Acts 20:28; Rom. 9:5; Titus 2:13; Heb. 1:8; 2 Peter 1:1; 1 John 5:20).4 First of all, we never find such statements qualified in a way that would indicate they are figurative. Second, in the context of these NT statements the references to Jesus as theos are expressing his religious significance to those who believe in him. In other words, that Jesus is theos is a confessional affirmation, akin religiously to the affirmation that Jesus is kurios (“Lord”). This is obviously not the case in the Exodus texts: The Lord did not tell Moses that he would be God or as God to the Israelites, but to Pharaoh—who obviously did not believe in Moses! Third, these references to Jesus as God sometimes include expressions that underscore the religious, spiritual significance of Jesus as theos, such as Thomas’s confession of Jesus as “my God” (John 20:28) and the descriptions of Jesus as “our great God and Savior” (Titus 2:13; 2 Peter 1:1). Fourth, in the context of these statements additional statements are made that reveal Christ to be God, such as that he existed in the beginning, that all things were made through him, that his future manifestation is our hope, and that he redeemed us to be his people (e.g., John 1:1-5; Titus 2:13-14). Of course, the Bible never says things like this about Moses. Only by mistakenly reading Exodus 4:16 and 7:1 as literal descriptions of Moses could one think they taught that Moses was a divine being. It is interesting to note that prior to Joseph Smith developing his own radical ideas about humans becoming gods, he had trouble with Exodus 7:1. In his revision of the KJV, which Mormons call the Joseph Smith Translation, Joseph revised Exodus 7:1 to say, “I have made thee a prophet to Pharaoh: and Aaron thy brother shall be thy spokesman” (Exod. 7:1 JST). 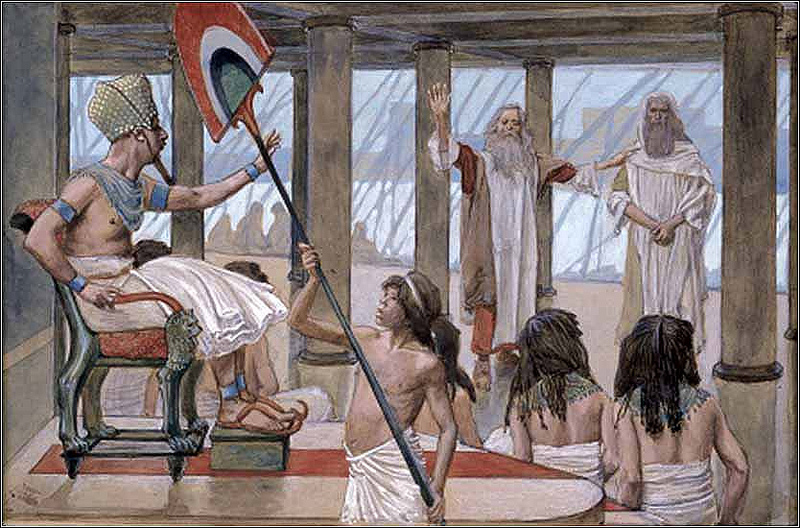 LDS scholar Terryl Givens acknowledges that the language of Exodus 7:1 “seems figurative,” but maintains nevertheless that the verse “suggests that God has given to Moses some kind of godlike status.”5 This claim should not be viewed in a vacuum. The LDS Church has a very specific understanding of what it means for humans to become gods. In LDS doctrine, all human beings were the spirit children of Heavenly Father (and Heavenly Mother) in a preexistent heavenly state prior to their conception and birth as mortals with bodies of flesh and bones. We became earthly mortals as a stage toward the eventual goal of returning to the Father’s presence in the celestial kingdom and becoming gods like him. Mortality is necessary because godhood (normally) requires a flesh-and-bone body that has died and been resurrected with immortality. Only after death and resurrection can a mortal become a god (and even then it is not automatic or guaranteed). This process of becoming gods is known in Mormon doctrine as exaltation. Now, obviously Moses had not yet died and risen from the dead when the Lord “made” Moses to be as God to Pharaoh. Even if one takes the KJV wording (which again, Joseph himself at one point rejected!) that the Lord made Moses “a god to Pharaoh” (Exod. 7:1 KJV), this cannot have anything to do with Moses becoming an exalted immortal being in heaven after his death and resurrection. In LDS doctrine, a human being that becomes exalted literally becomes a god, not just a god to some mortal. So whatever Exodus 7:1 means, it does not affirm, support, or even suggest anything like the LDS doctrine of exaltation. In conclusion, the Book of Exodus does not affirm that Moses actually was theos, but rather speaks of him figuratively as God in relation to Aaron or Pharaoh. Moses, then, was not a god. He cannot be cited as an example of a creature exalted to godhood, as taught in theLDSChurch. Nor can he be cited as precedent for the Jehovah’s Witness teaching that Jesus is a creature who is a god inferior to the true God. 1. E.g., Elijah Daniels (pseud. ), “The ‘Definite’ John 1:1,” Defending Jehovah’s Witnesses (blog), June 29, 2013. See also the cautious remarks in Greg Stafford, Jehovah’s Witnesses Defended: An Answer to Scholars and Critics, 2nd ed. (Huntington Beach, CA: Elihu Books, 2000), 99, 112. The blog of “Elijah Daniels” is not associated with Stafford or his book. See also the use of the argument that Moses was called God in a representative sense by Adventist writer David Barron, God and Christ: Examining the Evidence for a Biblical Doctrine (ScripturalTruths.com, 2009), 3. 2. E.g., Terryl L. Givens, Wrestling the Angel: The Foundations of Mormon Thought: Cosmos, God, Humanity (Oxford: Oxford University Press, 2015), 258-59. For a popular LDS use of this argument, see Jeff Lindsay, “Theosis, the Divine Potential of Mankind: LDS and Early Christian Perspectives,” LDS FAQ: Mormon Answers, last updated 2010. 3. Contrary to Brenton’s translation of the LXX, which was probably influenced by the KJV. 4. On the translation and exegesis of these texts, see Robert M. Bowman Jr. and J. Ed Komoszewski, Putting Jesus in His Place: The Case for the Deity of Christ (Grand Rapids: Kregel, 2007), 138-56, 325-34. 5. Givens, Wrestling the Angel, 258. Givens appeals to the first-century Hellenistic Jewish philosopher Philo in support of this interpretation (259), but our concern here is with Exodus in its own context. It should be noted, however, that Philo did not understand Moses to be a god in the LDS sense of a resurrected, immortal, and essentially divine being.